This would be a great side dish for a large crowd or a light luncheon. 1. Toss eggplant, bell peppers, onion and minced garlic with 1/3 cup of olive oil, salt and pepper and place in a single layer on large baking sheet. Roast about 40 minutes until brown at 425 degrees. Turn vegetables once half way through roasting. 2. Toast Pine nuts in a 375 degrees for about 2-3 minutes. Start to watch pine nuts about 2 minutes, they burn very quickly. Set aside. 3. Mix dressing ingredients in a small bowl and set aside. 4. Cook orzo or gluten free pasta according to package instructions about half way through roasting the vegetables, drain and rinse briefly with warm water, put in large bowl. You want the pasta to be warm when you assembly so that the pasta will absorb the dressing. 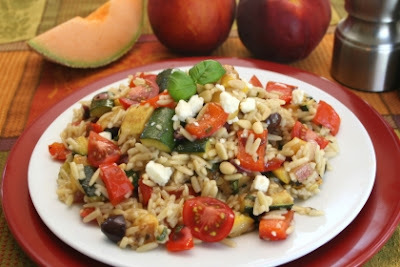 To the orzo add roasted vegetables and pan drippings, pour dressing and blend. Let cool to room temperature. Before serving, top with add scallions, pine nuts, feta cheese and basil. For variation: can substitute other vegetables to roast, i.e., summer squash or zucchini, portabella mushrooms, fresh tomatoes or cherry tomatoes. For protein, add cooked shrimp or chicken.